Robert A.M. Stern was the critic no one wanted to have when I was a student at Columbia. If you put his studio as anything but last in your preferences, you would get him. It was a widely held belief that if you took his studio, you'd be forced to do po-mo work all the time. This was far from reality, as I learned by sitting in a studio immediately adjacent to Bob Stern's studio, and overhearing his desk crits. Mr. Stern was a pragmatic critic, holding students' feet to the fire on making their projects work, and making their product match their premises. In short, he was an unwavering demand that your proposal live up to your words about it. I secretly loved him for that: Columbia in the mid 1990s was a lot of words and renderings of clouds, and light on the discussion of how buildings work in the world. Yet a continued disappointment is that while Mr. Stern's office tends to produce architecture that contributes to the city, and is even civic in a traditional sense (in that it is guided by having generous and appropriately grand public spaces), the materials, forms, and sequences rarely thrill. There is no bite. Of course, in this day and age, good architecture is a category that is hard to find. There is bad architecture, poor architecture, lame architecture, tired architecture, acceptable architcture, not bad architecture, and, occasionally, Great Architecture. But good is a category underrepresented. 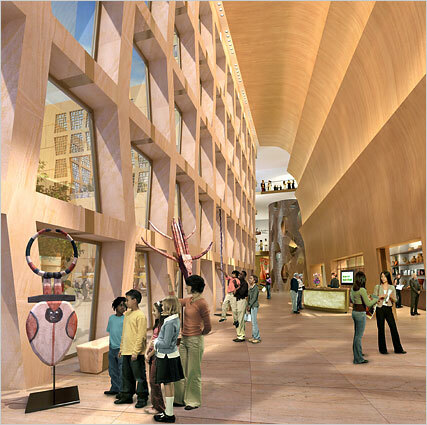 We file Mr. Stern's design for the Museum of African Art in the good-to-very-good category. It's an acceptably civic front that abstracts a non-19th century western architectural form, and it has a innovative (but workable!) mix of residential development and institutional functions. And, it's got the best salesman in the business behind an institution without a permanent home.